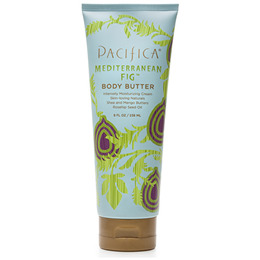 Pacifica Body Butter Mediterranean Fig - 236ml - Smell incredible with our nourishing and anti-oxidant rich ingredients. Our body butter helps fight signs of aging while adding deep moisture and protection. Made with nature`s best moisturizers - shea butter, almond oil and safflower oil - Pacifica`s paraben-free Body Butter is a skin must-have. Now available in tubes in our best-selling fragrances, making them easy to take with you anywhere. Below are reviews of Pacifica Body Butter Mediterranean Fig - 236ml by bodykind customers. If you have tried this product we'd love to hear what you think so please leave a review. Great moisturiser, I don't like the scent though. Gorgeous smell, not too strong but lasts a long time. Also keeps my skin moisturised all day. Pacifica Body Butter Mediterranean Fig - 236ml - Earth meets ocean in this green, full-bodied blend with Sweet Fig, Palm, Cyclamen, Moss and Clove, all set in a luscious Sandalwood base.